Several years ago, I purchased and ate a sweet and sour tofu and vegetable meal from a bar close to my work. A short time later, I got sick. After that, for several months, I couldn't stand the thought of eating tofu. There was no proof that it was tofu that made me sick - could have been the sauce or the vegetables or something else I had eaten earlier that day. Or I could have come in contact with some air borne virus. But none of that mattered. I equated tofu with getting sick. Classical conditioning is about associations (good or bad). Sometimes a certain smell or a song can bring up memories of a certain person or event. If a child is often hit with a ruler, that person might grow up to cringe every time a ruler is seen. Our pets experience classical conditioning. If we yank our dogs by the neck every time they look at children, our pets might begin to hate children - because looking at children causes pain. If we give our dogs treats every time they look at children, then our pets might become happy and excited whenever a child comes into view - because children make tasty treats happen. But just like in my tofu incident, we don't always have control over what associations our dogs might form. 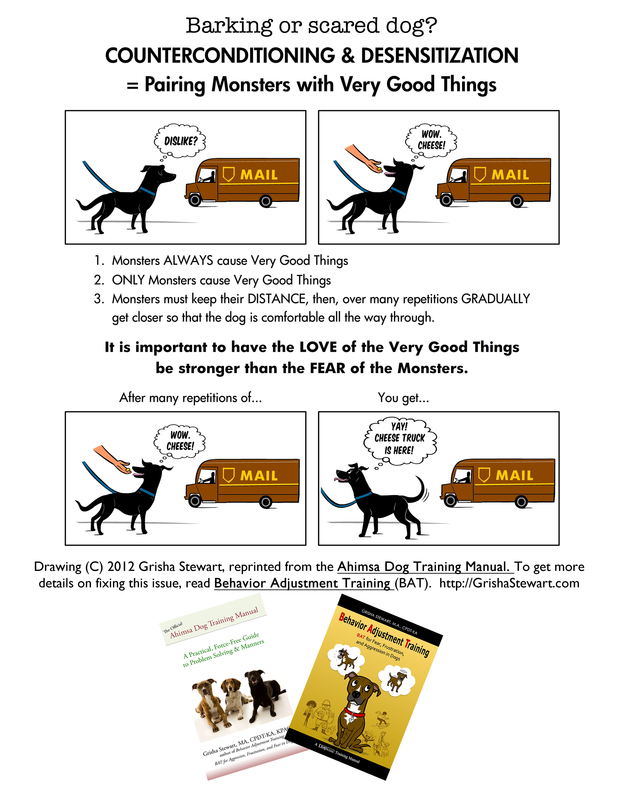 A couple of years ago, I was in a training class where some of the dogs were reactive. The instructor was spraying the dogs in their faces with vinegar water to shut them up (not something I would recommend). I watched this instructor spray one Doberman in the face. This dog looked completely dejected and he continued to looked sad for some time afterwards. I said to myself, this dog is probably going to become afraid of men or men with beards or men with glasses. I hope that I'm wrong, and the dog got over the incident. Not only will different dogs experience different associations, dogs handle traumatic events differently. Right next to the sad Doberman was a barky Rottweiler. When the instructor sprayed the Rottie in the face, the dog appeared happy and relaxed and he also licked up all the vinegar water than went on the floor. So basically that dog was rewarded for barking. Sometimes, whether or not an event will affect a dog depends on how many good and bad experiences the dog has had. Your question asks about a car wreck. If a dog has had several fun car rides, then the dog might think nothing of one scary car ride. If a dog has never been in a car before and was already apprehensive, then was in a wreck, there is a chance that the dog might become of afraid of vehicles. But just like my tofu incident, the dog decides* what is scary. If your dog saw a deer right before the accident happened, then the dog might become afraid of deer - not cars. Or maybe both deer and cars. Or if the dog is very resilient, maybe nothing. *Well, technically, the dog doesn't really "decide". The dog doesn't have control over what associations are formed. So that was the long answer to your question. The short answer is, depends on the dog and depends on the situation. Tell us your classical conditioning stories in the comments section below. As always -- great post. Thank you. Any kind of aversive can have the unintended consequence of a negative association to something or someone that was nearby at the time of the aversive. This is one of the terrible side-effects of using positive punishment. I hope that the time will soon come when people will only use positive reinforcement. Pets and people will be so much happier. Great post, thanks. I think, academically speaking, this also paradoxically explains why positive reinforcement can have unintended side-effects. Thanks @Isleep. Yep. Positive or negative training can have unintended side effects. But the great thing about positive based training is that mistakes are easily fixed. Sometimes the mental (and even physical) scars from negative training can have lasting effects.